Stoke XI: Butland; Johnson, Cameron, Wilson, Pieters; v.Ginkel, Whelan; Shaqiri, Bojan, Arnautovic; Walters. Leicester XI: Schmeichel, De Laet, Huth, Morgan, Schlupp, Kanté, Drinkwater, Inler, Mahrez, Okazaki, Vardy. They couldn't quite match last week's effort of coming back from 2-0 down to win but Leicester will be delighted to secure a point. For Stoke, a sickener as they throw away a comfortable advantage and are still without a win this season. Thanks for joining us. Follow all the reaction on our main live text commentary here. Jamie Vardy nearly wins it for Leicester but his low shot is just wide. End-to-end stuff. Breathless and anxious. Stephen Ireland is far too indecisive, trying to chip in a cross when the Stoke substitute had space for a shot on the edge of the box. 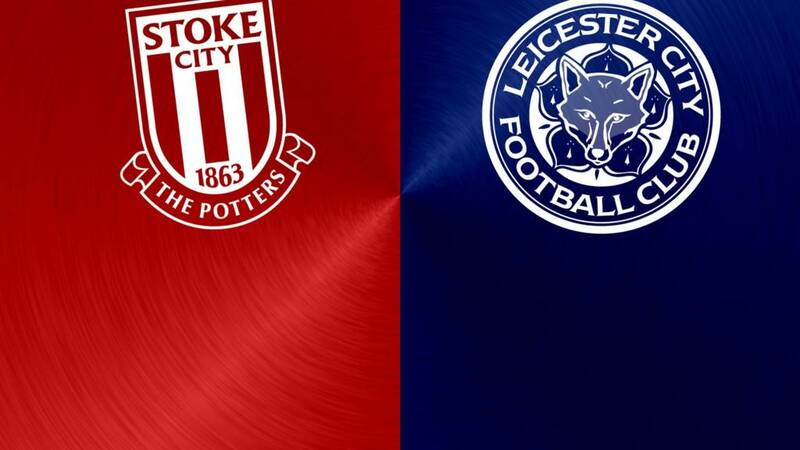 Leicester now on the back foot as Stoke desperately try to earn a win that seemed so likely at half-time. Two minutes to go. Can anyone find a winner? Stoke are now looking more threatening. "This game is on a knife-edge"
"After a great start, Stoke have choked. And Leicester have switched it on. Mark Hughes' side are under an awful lot of pressure and this game is on a knife-edge." Damilare Joseph: I wouldn't want to play Leicester City in their comeback form. You are never guaranteed a lead until final whistle. This seems strange on the face of it - looking at Leicester's second goal in graphical form, it starts with Danny Drinkwater (no.4) running with the ball for about 30 yards in the wrong direction after collecting Kasper Schmeichel's clearance. But going backwards obviously paid off because once Drinkwater was in his own half, he found Riyad Mahrez, who played in Jamie Vardy... and the result was the equaliser. Bojan has done well to last this long but he is now replaced by Stoke striker Peter Odemwingie. Jeff Schlupp goes into the book for bringing down Xherdan Shaqiri right on the edge of the area. Shaqiri gets up and fires in the free-kick,which is well saved by Kasper Schmeichel. Geoff Cameron almost restores Stoke's lead but his header from Xherdan Shaqiri's free-kick is just, just wide. Danny Drinkwater was booked for the challenge that led to the free-kick. And Stephen Ireland has come on for Marco van Ginkel. Peter Crouch comes on for the final 15 minutes, replacing Marko Arnautovic. Walters has now won a free-kick, and it was greeted by ironic cheers from disgruntled Stoke fans. "From 2-0 down, Tinkerman (aka Ranieri) has done it again". "Stoke fans and their players will now be very, very nervous..."
The comeback kings have done it again! Jamie Vardy shows superb strength as gets on the end of a long ball forward to slide the ball under Jack Butland. Stoke are furious as they feel they should have had a free-kick shortly beforehand. Can Leicester go on and win it? Stoke break forward as Bojan gets clear down the right-hand side - his cross is just too far ahead of Jonathan Walters. A better delivery and Walters would have had a clear sight of goal. Leonardo Ulloa on for Shinji Okazaki as Leicester continue to press. Sharp work from Jack Butland to get down low at his near post to keep out Jamie Vardy's shot after the Leicester striker turned inside Marc Wilson and left the Stoke man on his backside. It's very open now. It feels like there are more goals to come. N'Golo Kante gets a deserved booking for hacking down Bojan, shortly after Riyad Mahrez also went into the book. "Mahrez undoubtedly has great ability, and Ranieri is encouraging him to go out there and express himself. And what an impact he's made on the Premier League." "If Leicester equalise, my money is on them winning this game. That's how football can swing." Leicester have finally woken up. They win a corner and Jamie Vardy tries a shot but the ball is behind him and he can't control his effort. The Foxes came back from 2-0 down to win last week. Can they do it again? Riyad Mahrez makes no mistake, sending Jack Butland the wrong way to cut Stoke's lead to 2-1. It's his fifth goal of the season. Punishment for a clumsy challenge by Arnautovic. Danny Drinkwater goes down under Marko Arnautovic's challenge and referee Andre Marriner points to the spot. A lifeline for Leicester? Leicester, unsurprisingly, have made a change with Marc Albrighton coming on for Gokhan Inler. Can he inspire a comeback from the Foxes after a meek and mediocre first half? Stoke's second goal really was a horror show for Leicester skipper Wes Morgan. The Foxes allowed Jack Butland's clearance to bounce and Morgan's attempted backpass was ill-conceived and badly executed. A gift for Jonathan Walters. Superb first half for the home side. Leicester actually looked more comfortable early on but once Bojan made the breakthrough, there was only one team in it. A lot to do for the Foxes if they are to protect their unbeaten record. Will Claudio Ranieri make any changes for the second half? A minute to half-time and not much happening as Stoke look to protect their lead to the break. The are looking comfortable. Stoke dominating in possession and territory so far with the home side seeing 57% of the ball. Meanwhile, Bojan tries his luck from over 40 yards as he spots Kasper Schmeichel off his line but the Spaniard's chip is wide of the target. Bojan at the heart of more good play from Stoke and his floated cross is just about headed clear by a stretching Robert Huth. The Foxes break forward but Ritchie De Laet's shot is wide. Danny Drinkwater has a shot that is deflected wide for a corner. Shortly after N'golo Kante has a more powerful dig from distance that Jack Butland does well to save. Better from Leicester, as they try to get a foothold in the game. Two corners in succession for Stoke ends with Geoff Cameron crossing across the face of the Leicester goal and Jonathan Walters and Marco van Ginkel are both inches away from getting a boot on it. Any kind of touch and that would have been 3-0. Leicester very, very unsettled. Leicester are shell-shocked since conceding two within eight minutes. Riyad Mahrez gives the ball away and Stoke win the first corner of the game. The home team are well on top. Oh dear, Wes Morgan. What were you thinking? A long clearance from Jack Butland is allowed to bounce and the Leicester captain attempts a horrible volleyed backpass, which rolls just a few yards into the path of Jonathan Walters and the Stoke striker slots coolly past Kasper Schmeichel. What a start for the Potters! "He slid in Bojan just superbly"
"Arnautovic cuts across the full-back and puts him completely out of the game. Then he slid in Bojan just superbly." Leicester look to respond immediately and Riyad Mahrez threatens again as he cuts in from the right but it's straight into Jack Butland's safe arms. Stoke are knocking it about nicely now, though. Anxiety definitely lifted among fans and players. Back in the starting line-up for the first time since these sides met in January, Bojan runs on to Marko Arnautovic's cute pass and fires low past Kasper Schmeichel. Just Stoke's fourth goal of the season but it's lifted the mood at the Britannia after Leicester made the brighter opening. No pizza for the Leicester lads tonight! First sight of goal and it goes to that man Riyad Mahrez but the Leicester man's shot from the edge of the box is straight at Jack Butland. Bojan has plenty of space in the middle of the Leicester half but his pass, aimed at Marko Arnautovic, is too short. Leicester quickly counter through the dangerously in-form Riyad Mahrez but he is robbed of the ball as he charges into the penalty area. Good run down the left from Leicester's Jeff Schlupp but his cross is too close to Jack Butland, who has made 29 saves so far this season - more than any other keeper in the Premier League. N'golo Kante surges forward for Leicester as the French midfielder tries to enliven a cagey opening but Stoke crowd him out. The Potters have never lost three successive home games in the Premier League. They don't want to change that today. Almost all set on a lovely late summer's afternoon in Stoke. Can the home team get their season up and running? Can Leicester maintain their superb start? "Leicester are passing it around, they are confident and nobody thought this would happen this season after Nigel Pearson left. This form, this confidence within the side, has been outstanding. "Some of the goals they have scored have been outstanding, and they are giving themselves a chance to score in every game." "Who would have thought that after five games this fixture would be third-bottom against second-top? It's a reflection of the two clubs' early contrasting fortunes. "Leicester have been a breath of fresh air so far. Claudio Ranieri has cleverly used the foundations and momentum from last season to huge effect. He has a team full of confidence and, in Riyad Mahrez, one of the in-form players in the league. "Stoke will hope to halt their progress though and record their first win to kickstart their season. They have back-to-back home games and will be desperate to rediscover their usual form at the Britannia Stadium." "Stoke were lucky to get away with only losing 2-0 at Arsenal last week, and they have their keeper Jack Butland to thank for that. He has been their best player so far this season. "Leicester's comeback from 2-0 down to beat Aston Villa showed their confidence and the attacking options at Claudio Ranieri's disposal. "But, you know what? I fancy Stoke to beat them. Mark Hughes' side are back at home and things are going to click for them at some point because they are a much better team than they have shown us so far." Stoke's defence had better be sharp today as Leicester's Jamie Vardy, Jeff Schlupp and Marc Albrighton (who is on the bench) were named as the three fastest players in the division this week, leading Claudio Ranieri to compare them to fighter jets. He said: "I say my team is like the RAF, it's fantastic - whoosh whoosh! - I love it." As we mentioned before, Leicester boss Claudio Ranieri wants a clean sheet and it's pizza all round for his players if they achieve it. Last week's thrilling comeback from 2-0 down to beat Aston Villa 3-2 was too much for him. "Coming back from behind might be exciting, but it is not good," he said. "I told them, if you keep a clean sheet, I'll buy pizza for everybody. I think they're waiting for me to offer a hot dog too." Is Mark Hughes worried by Stoke's win-less start? Apparently not. He said: "There's absolutely no apprehension regarding the start we have made because we are building for the remainder of the season and are confident of being incredibly competitive and picking up the points we want. "There is absolutely no worry within the building." Agree, Stoke fans? Get in touch at #bbcfootball. Bojan has been sorely missed by Stoke since he suffered a cruciate ligament injury in January. One week before his injury, the Spanish midfielder scored the winning goal the last time these teams met when Stoke won 1-0 at the King Power Stadium. As he returns to the starting line-up, can he make the difference again this afternoon? Stoke boss Mark Hughes has made four changes from last week's defeat at Arsenal and the big headline is that Bojan is starting. It's the Spanish midfielder's first start since January after recovering from his serious knee injury and striker Jonathan Walters is back up front as top scorer Mame Diouf is unfit with a hamstring strain. Defenders Glen Johnson and Marc Wilson are also added to the starting XI. Also dropping out are Phil Bardsley, Marc Muniesa and Mato Joselu. Just the one change for Leicester as French midfielder N'golo Kante comes in for Marc Albrighton. Can Stoke lift the gloom? Stoke City are also searching for their first clean sheet of 2015-16 but the two sides could hardly have had more contrasting starts. While Leicester lie second in the Premier League, the Potters are down in 18th and are still searching for their first win. The previously formidable Britannia Stadium has also been witness to two losses from their opening two home games. Can Mark Hughes's side rid themselves of the taste of defeat? Will Claudio be buying dinner tonight? Claudio Ranieri is a hard man to please. His Leicester side may be unbeaten but he wants a first clean sheet of the season - and he'll buy all his players pizza if they deliver one against Stoke City. Welcome to our live page for this afternoon's game.